More screenshots of the open world One Piece game. One Piece: World Seeker is coming to the Americas and Europe in 2018 for PlayStation 4, Xbox One, and PC, Bandai Namco announced. The game, which celebrates the 20th anniversary of the One Piece manga, is described as “the most ambitious One Piece game ever” with an open world to roam around freely. 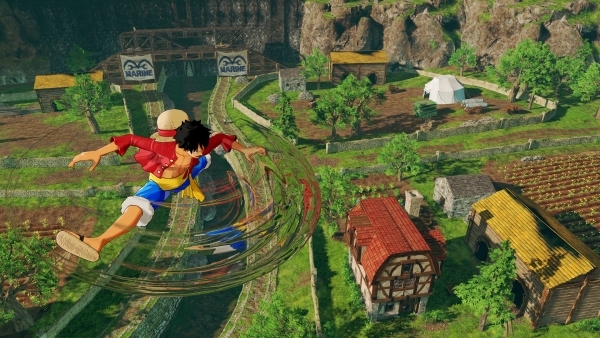 As Luffy, players will experience and wage battles in an “expansive and seamless world” filled with castles, cities, beaches, and more “exciting and diverse” locations. Set sail in an all-new One Piece adventure in One Piece: World Seeker! Luffy and the Straw Hat Pirates are back in a new story that puts players’ into Luffy’s point of view, as he battles and explores an expansive and seamless world. Open landscapes provide many paths for players to experience Luffy’s Gum-Gum abilities and swing into action. One Piece: World Seeker is the biggest One Piece game to date! A One Piece adventure with open fields to explore. Explore seamless and expansive areas in an all-new adventure. Experience an epic new story from Luffy’s point of view with all of his Gum-Gum abilities. As announced yesterday, the first trailer for One Piece: World Seeker will debut at Jump Festa 2018, which runs from December 16 to 17 at the Makuhari Messe in Chiba, Japan.